This struct holds all settings that control the output of the binary instruction unparser. 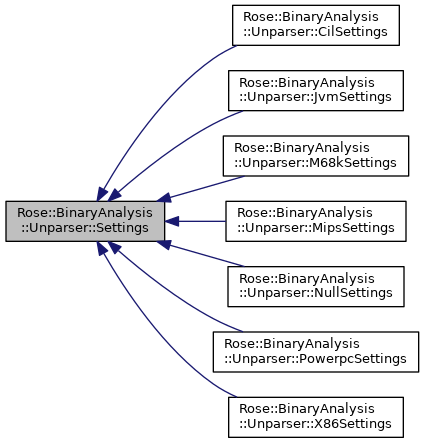 Particular subclasses of the basic unparser may have settings that derive from these base settings. The commandLineSwitches function can be used to control these settings from a command-line. Definition at line 18 of file BinaryUnparser.h. Show results of may-return analysis? Definition at line 22 of file BinaryUnparser.h. Definition at line 23 of file BinaryUnparser.h. Definition at line 25 of file BinaryUnparser.h. Definition at line 29 of file BinaryUnparser.h. Definition at line 47 of file BinaryUnparser.h. Definition at line 50 of file BinaryUnparser.h. Min characters to use for the comment field. Min characters to use for the operand list. Min characters to use for the instruction mnemonic. Min characters to use for the stack delta field. Min characters to use for the bytes field. Definition at line 57 of file BinaryUnparser.h. Definition at line 62 of file BinaryUnparser.h. Definition at line 73 of file BinaryUnparser.h. Definition at line 77 of file BinaryUnparser.h. Definition at line 84 of file BinaryUnparser.h. Definition at line 85 of file BinaryUnparser.h. Definition at line 91 of file BinaryUnparser.h. Definition at line 92 of file BinaryUnparser.h. Definition at line 97 of file BinaryUnparser.h.